Verification: This message is in relation to petition and judgment at High court of Sindh at Karachi. It is not from India. This message is not from Indian High court but is from Pakistan. A petition was filed against a school fees Hike on 18th September 2015 to which the judgement came out in April 2018. Without the full information this message is being shared in India. Please dont forward this. Please check the facts and share with others. After Protest and lots of contend a petition has been filed CP D No. 5812/2015 on 18-09-2015 in Honorable High Court of Sindh at Karachi against the Generations School Illegal Enhancement of fees. A Certified Copy of Stay Order dated 18-09-2015 against the illegal enhancement of fees against the Generations School Pakistan (Karachi Region). Notices has been issued to the respondents for 22-09-2015. 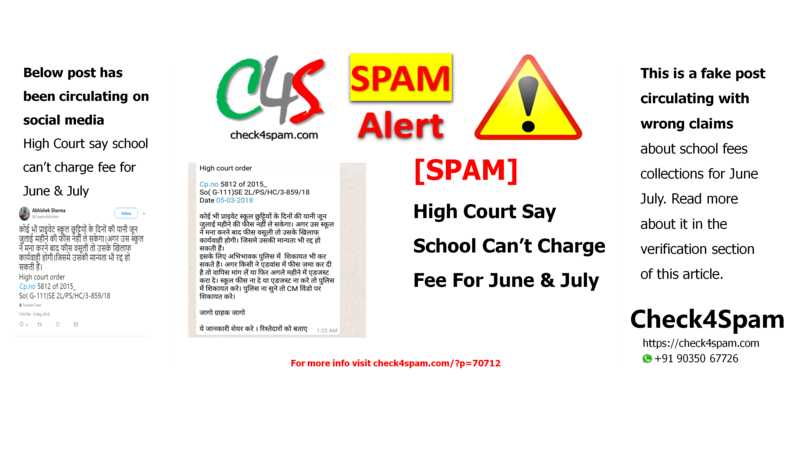 Parents of students and “Siddiqui and Fattani” ( Advocates and Legal Consultants of this case) requested to all parents whom children studying in different schools must go in court of law if they are facing the fees issue before School expelled your children.